Beavercreek junior midfielder Jonah Ackerson battles for possession with Bellbrook senior Evan Terry, during the first half of the Tuesday Sept. 12 boys high school soccer game at Beavercreek High School. Beavercreek forward Dominic Calabrese cuts between Bellbrook defenders Aaron Keefer (7) and Owen Ebel, in first-half action Sept. 12 at Beavercreek High School. Beavercreek players Vaughn Ernst (12) and Ryan Bernt (4) double team Bellbrook junior captain Gavin Ferrin in the first half of Tuesday’s Sept. 12 boys high school soccer match between the two state-ranked teams, at Beavercreek High. BEAVERCREEK — Mere days after playing last season’s Division I state runner-up to a tie, and being voted No. 4 in the first Division I state soccer poll, Beavercreek had to work a bit to fend off an upset minded Bellbrook team that was also ranked. Host Beavercreek broke open a close one-goal battle with two goals in the final 17 minutes to claim a 4-1 win. Beavers coach John Guiliano said his team’s play reflected the way the team practiced the day before. 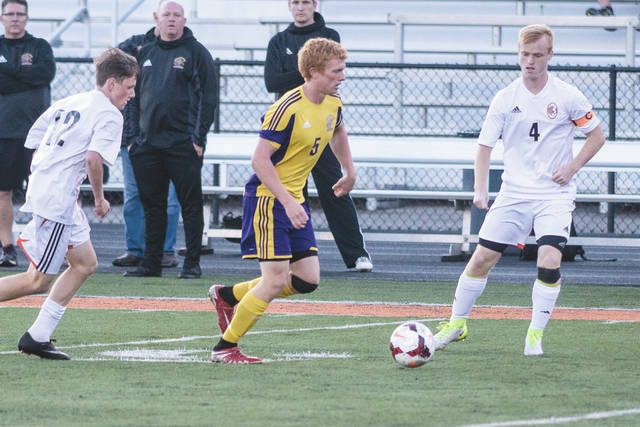 Bellbrook often packed 6-8 defenders back in hopes of creating a counter attack of some kind against the always attacking Beavers, and it appeared to frustrate Beavercreek early on. 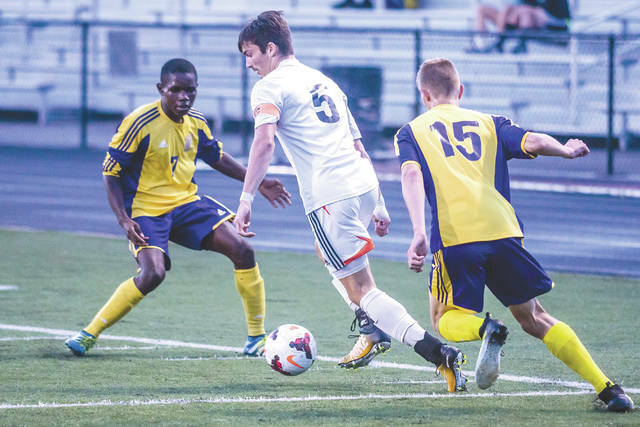 It wasn’t until junior midfielder Hunter Jackson took a long pass and slipped behind that purple and white wall that Beavercreek was able to get on the scoreboard. Jackson scored from the left side just under 16 minutes into the first half to put the Beavers ahead 1-0. In the second half, with at least eight Golden Eagles packed within 20 yards of the Bellbrook goal in defense, Ryan Wightman launched a high rainbow kick from about 30 yards that slipped in under the goal crossbar for a score, and a 2-0 Beavers lead with 36:15 left to play. Four minutes later, Bellbrook junior Michael Owusu shocked Beavercreek with a header score from the left side to pull the Golden Eagles within one goal, 2-1. Bellbrook, incidentally, was among 20 Division II teams to receive votes in the first Ohio Scholastic Soccer Coaches Association poll. Coach Kevin Terrill said he puts powerhouses like Beavercreek on the schedule in order for his team to be able to experience what playing a state caliber team is like during the regular season. “We are fortunate to play top area teams around us like Beavercreek. It gives us a good tournament-like experience. These are the kinds of quality teams that you end up playing in the post season. Obviously Beavercreek is a better team, don’t get me wrong, but I felt like we had a fighting chance tonight. And that was our goal going into this,” Terrill said. 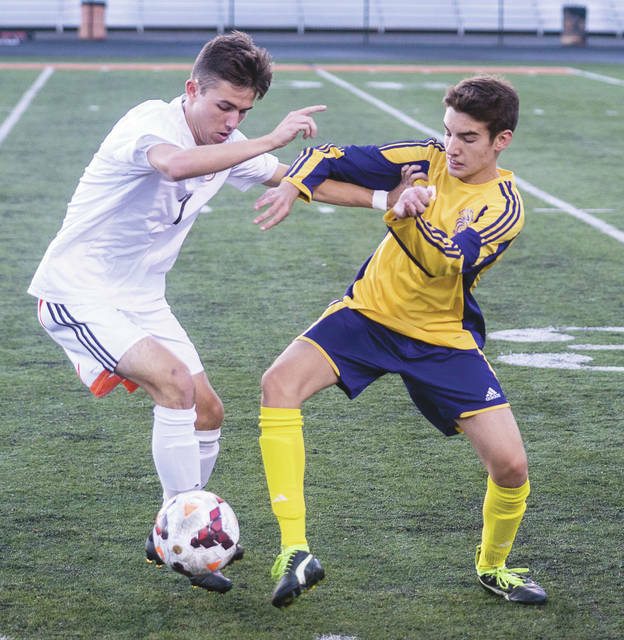 Once Beavercreek had lost its two-goal cushion, the Beavers’ intensity seemed to climb. Moments after Bellbrook’s hard-charging senior Evan Terry was fouled just outside the Beavercreek penalty box, Beavercreek went on the offensive. Two minutes later, Even Williams bashed a low liner from the right side for a ‘Creek score with 17:37 left to play. Ackerson’s corner kick from the left side and fired a score in from about 15 yards out for the Beavers’ fourth and final goal of the night. Terrill was happy with the way his Eagles played defense against the favored Beavers. He credited Ryan Hunt, Adam Galle, Seth Ryan and Owen Ebel for their superb defensive play. Bellbrook is back on the pitch at 7:15 p.m. Thursday Sept. 14 at Monroe in what could be a key Southwestern Buckeye League Southwestern divisional battle. The two teams are currently undefeated in the Southwestern division. Beavercreek gets back into Greater Western Ohio Conference, National East divisional play at 7 p.m. Saturday Sept. 16 when they will host Springfield.